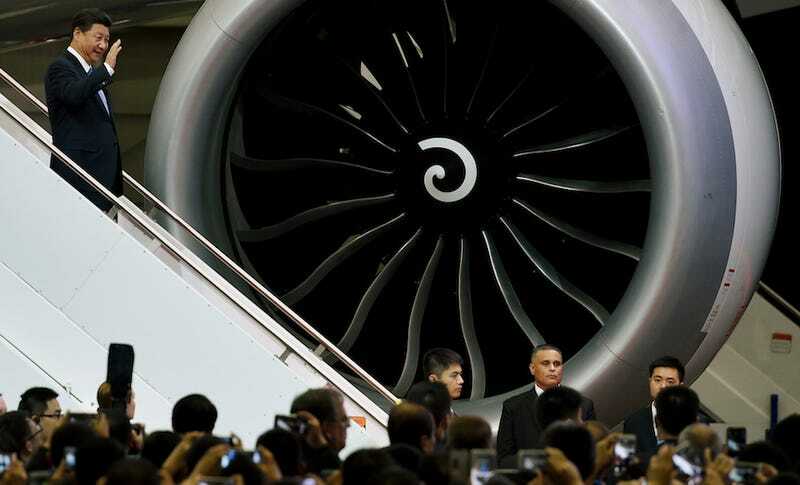 What Does Boeing's New Deal With China Really Mean? Chinese President Xi Jinping made a big trip to the U.S. this week, making a first stop in the Seattle area to visit Boeing. During his visit, Boeing announced two major developments. The first of these was a Chinese order for 300 new jets, including 250 737s, a deal worth $38 billion. The second announcement pertains to a new 737 delivery and completion center in China, which will cause some work normally done in the U.S. to be shifted overseas. As it stands right now, new 737s are delivered at Boeing’s Commercial Delivery Center (CDC) at Boeing Field in Seattle. That’s not only where customers get their new planes, it’s also where final assembly takes place, from the interior installation to the exterior paint work. But Boeing’s announcement that 737s bound for the Chinese market will now undergo completion and receive final assembly work at newly-planned facilities in China did more than just raise eyebrows. About 100 people representing the Machinists union protested the announcement outside Boeing’s plant in Renton, expressing serious concerns that the new facilities in China were the first step in shifting much more work overseas. Even though there have been strides in keeping aircraft manufacturing jobs in Washington state, Boeing’s planned new facility in China could open the door for expanded aircraft manufacturing work there in the future. Boeing’s manufacturing presence in the Seattle area has so far been retained by massive tax incentives. In 2013, the state of Washington extended Boeing an $8.7 billion tax break in exchange for an agreement to build the new 777X widebody in the state. Construction of a massive new manufacturing facility for the 777X composite folding wing is currently in progress. Boeing, however, contends that their intention to complete and deliver new 737s in China won’t come at the expense of jobs or work in Seattle. The company is currently completing 737s at a rate of 42 new jets per month, but they’ve long planned to increase that rate even further, aiming as high as 52 completed aircraft per month by 2018. Both Boeing and Airbus currently have a record high backlog of jet orders, numbering in the thousands. Over the next 20 years, Boeing is forecasting a doubling of the global commercial aircraft fleet to 43,560 aircraft (as of 2014, there were approximately 21,600 jets in service worldwide). The majority of anticipated new customers are expected to come from emerging markets in Asia, with the Chinese market seen as a major sales opportunity. To meet this future demand, Boeing says they need to build inroads to these key growth opportunities now. It is important to understand China’s role as a Boeing customer when considering the newly-announced Chinese 737 delivery center. China has purchased over 1,500 jets from Boeing, which places them as the company’s largest international customer, and their appetite for new commercial jets is expected to remain strong. And while new completion and delivery centers in China will likely help Boeing secure additional orders from Chinese carriers, the strategy may create efficiencies in Boeing’s global supply chain that would facilitate their expanded production goals. In other words, by moving some jet completion tasks to China, Boeing might be better able to assemble more jets in Washington per month. Happening in parallel with Boeing’s announcement, China’s domestic COMAC (Commercial Aircraft Corporation of China) is now developing their own commercial aircraft. One of their planned models, the C919, will eventually compete with the Boeing 737 and Airbus A320. While deliveries of the C919 aren’t expected until 2018, Boeing’s move into China might be seen as hedge against this emerging competition. Interestingly, Boeing says they will be partnering with COMAC on the new 737 delivery and completion center. Beyond concerns about Boeing shifting jobs from the U.S. to China, we still don’t know what steps Boeing will take to ensure quality control in their new China facilities. China’s manufacturing sector has long been associated with low quality goods, which could have serious implications for how Boeing’s products are perceived. But perhaps more importantly, China frequently demands a transfer of intellectual property from international companies seeking to do business within the country. This means that Boeing may have to divulge company secrets that could embolden COMAC’s market strategy, potentially to the detriment of Boeing’s long-term health. So, while this week’s news could seem alarming for Boeing’s workers, the economic forecast seems to suggest that Boeing’s move into China is strategic. Building partnerships with their largest potential customer could very well generate the sales results required to sustain Boeing’s aggressive production schedule into the next decade and beyond. Still, the company will need to keep a watchful eye over the legacy it has created over the last century.